Living with a disability is not always easy – there are physical constraints, sometimes even in performing day to day chores. And our country does not provide for all those facilities that can make the life of a differently abled easy. It is often a challenge to find something to do, leave alone performing well in it. However, the human spirit is known to overcome physical and mental barriers to achieve their dreams. Vibhas Sen is a fine example of the above and has excelled both as a Paralympic swimmer and an International Wheelchair Fencer. 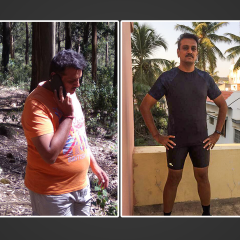 GOQii, the Health and Lifestyle company are proud to support Vibhas with coaching and nutrition guidelines to help him get fitter in his run up to the 2016 Paralympics in Brazil. Vibhas, who is now in his early 30s and works with a digital advertising firm has a very tough daily routine. He goes to work in the morning and after work heads straight for his practice and finishes his day by 10.30 pm. He says, “I was looking for a fitness tracker to measure my fitness and also get some guidance on nutrition. Fencing is a tough and tiring sport and requires a great deal of physical strength”. 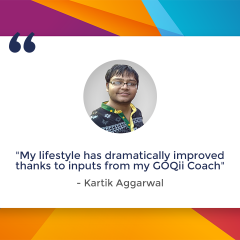 GOQii has provided Vibhas with the wearable and personalized coaching who will track his fitness and advise him on his nutrition and other aspects. Luke Coutinho, the Master Coach at GOQii will be personally overlooking his progress. 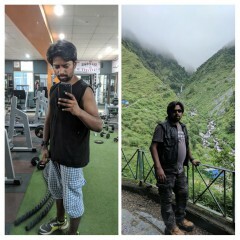 “I am glad I have a coach who will monitor my progress daily and advise me on what to eat and what not to, how much to work out etc. 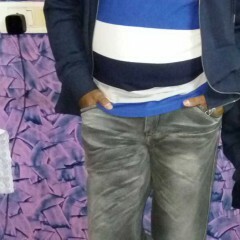 Technology will bridge the gap for me,” says Vibhas. Vibhas was born normal to his parents. But, at the age of 3 he was detected with Polio and since then he has been wheelchair bound. He was always interested in sports and wanted to play a sport. When he was in class 6, he aimed to learn swimming but, he only faced rejection from all the pools and coaches who refrained from taking me him on board. They told him he cannot learn swimming. So he dropped the idea and continued with his studies and led an extremely monotonous life. Although nothing deterred him from dreaming big. Vibhas was a regular at swimming for the sheer joy of it. Then one day his coach asked him to participate in a swimming competition in Pune and he won a Silver medal. That was the beginning of Vibhas taking up swimming seriously and at a professional level. He participated in many competitions and won two national level para-swimming events and several other state and district level awards within a year of taking up professional swimming. “After swimming for a year, I wanted to try out another sport which was more challenging and something that I could pursue for a longer time. A sport where age factor will not be a constraint. And I found fencing interesting,” says Vibhas. There are only 3 coaches in entire Mumbai for Fencing. Vibhas found a coach in Santosh Shejwal who is a National Institute of Sports Certified coach and was only coaching able-bodied persons. When Vibhas approached him he was not sure if he could coach him. Nevertheless, Shejwal said let’s give it a try. Within a year, Vibhas was quickly spotted by the National selectors of Wheelchair Fencing Federation of India to represent India. He then went on to get selected for the Wheelchair Fencing world Cup in Hungary in November 2014 and the grand Prix in Dec 2014 in Hong Kong. 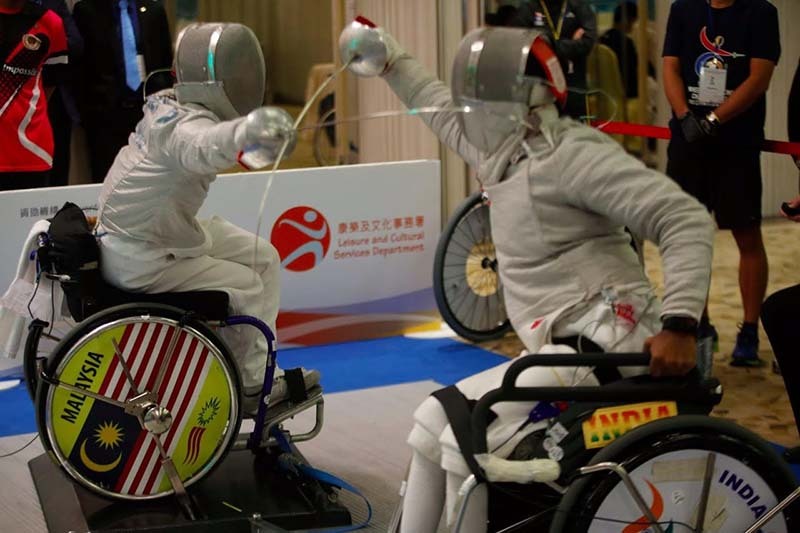 Wheelchair fencing is a version of fencing for athletes with a disability. The sport is governed by the International Wheelchair and Amputee Sports Federation that is a federation of the International Paralympic Committee. 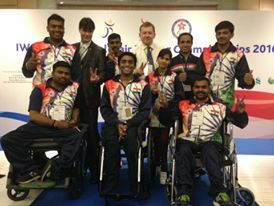 Currently, Vibhas is in Hong Kong competing in the Asian Wheelchair Fencing championship. This is in a run up to qualify for the 2016 Paralympics in Brazil. Vibhas needs to participate in at least five international wheelchair fencing events in order to be eligible for the 2016 Rio Paralympics. Due to lack of support from the National federation, Vibhas, has been funding his international competition participation through some corporate sponsorships and through crowd funding. He says, “It’s been difficult to raise funds. Last international competition I raised funds through crowd funding. If I am able to raise funds I will go for these events”. His current Asian championship has been sponsored by Essar Foundation. Despite so many constraints, Vibhas is confident of making it to the Paralympics. In his own words, “When someone says you can’t do it, you have got to secretly thank them. Let’s face it, proving them wrong is a huge motivator”. Vibhas’ larger goal is to win a gold in the Olympics.